Totally 559 clinical samples were tested by EliGene® MTB UNI Kit, 518 of them were blind samples with unknown status and 41 MTB positive samples verified by cultivation from Brno region. EliGene® MTB UNI Kit detected correctly all 52 positive samples. Totally 481 samples were correctly diagnosed by EliGene® MTB UNI Kit as MTB negative. Genus Mycobacterium comprises more than 50 species when among them obligatory pathogenic etiological agents of tuberculosis and leprosy and on the other hand also facultative pathogenic and non-pathogenic species representing important part of natural biotopes can be found. M. tuberculosis comprises to the one complex with genetically close related M. bovis and it is etiological agents of human tuberculosis. M. bovis is etiological agent of cattle tuberculosis and some others pets and wild beast and it is rarely detected in humans. Kriz P, Kralik P, Slany M, Slana I, Svobodova J, Parmova I, Barnet V, Jurek V, Pavlik I. 2011. Mycobacterium pinnipedii in a captive Southern sea lion (Otaria flavescens): a case report. Veterinarni Medicina, 56:307-313. Mendes A.C., Fernandes S.J., Ferreira L.C., Pereira M., Ramos H., Cabeda J.M. 2009. Evaluation of MTB Q Alert kit for detection of Mycobacterium tuberculosis directly on patient samples Clinical Microbiology and Infection, Suppl. 19, P1321. 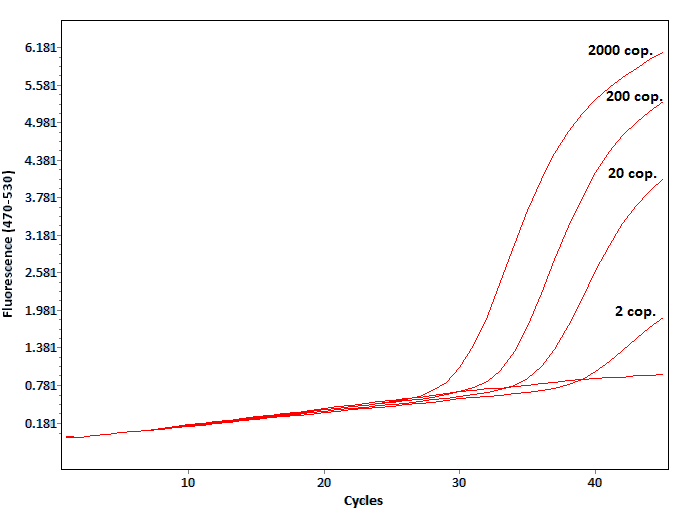 Sensitivity test of EliGene® MTB UNI kit on LightCycler® 2.0 instrument shows the detection of 2 DNA copies in reaction mix.